Next Stop.....the World! 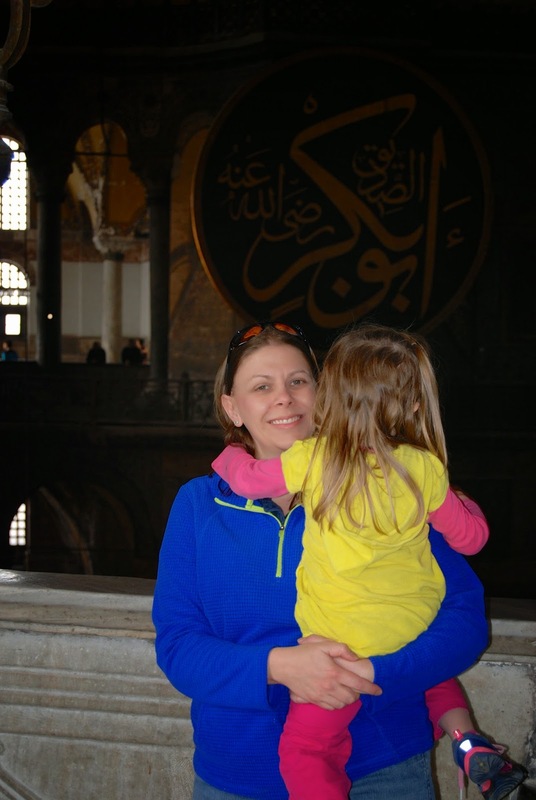 : We took a trip to Istanbul (not Constantinople)! Pretty much from the moment we started planning this trip I have had that 'They Might Be Giants' song on loop in my mind.....in fact, I corrupted Mason and he was walking around singing it a good portion of the trip....muwa-ha-ha. So we arrived mid-day, but once we got thru passport kontrol, found/took the light rail to the old city, hiked about 1/2 mile up-hill towards what we thought was the right direction (yeah afternoon sun helping us out), we arrived at our hotel. Our room wasn't quite ready so we got some cold beverages while we waited. Once in our room, we unloaded our backpacks and headed to the Grand Bazaar (another 1/2 mile up that hill). Since our bodies were still on Tbilisi time....it was past dinner time so as we wandered the mass of people to find a snack (yes, that is a sea of solid heads going down the alley). Clarissa did good staying in her stroller. She's old enough now that most of the time we don't buckle her in, but when we were in busy places like this we buckled her so that if a shiny object caught our eye for a few seconds we didn't have to worry about her disappearing. So we stopped at a small stand to get some freshly made (while we watched) pomegranate juice. While sipping the juice, the guys easily persuaded Richard into a kabob sandwich....which he thought was delicious. Just down from them I saw this guy and got me and the kids these pretzel-like rings of yumminess. I was taking pictures of the pretzels and kids eating them and the vendor really wanted to be in the action too! They were covered in sesame seeds, so while I love them I was worried the kids would refuse.....but they were so hungry they tried and liked them. In fact, Mason ate about half of Clarissa's also and got at least one everyday we were here! Sorry about the wardrobe malfunction on one of the belly dancer outfits.....all kinds of beautiful plates. We saw knock off purses and clothing, tons of sparkly jewelry...gold and gems. Clarissa is also in a stage where she doesn't like to smile for a photo until she's ready....which isn't always convenient.....you will see that throughout this trip....at least we will remember this stage with photos (and have memories of standing at passport kontrol and trying over and over for her to at least look at the camera). 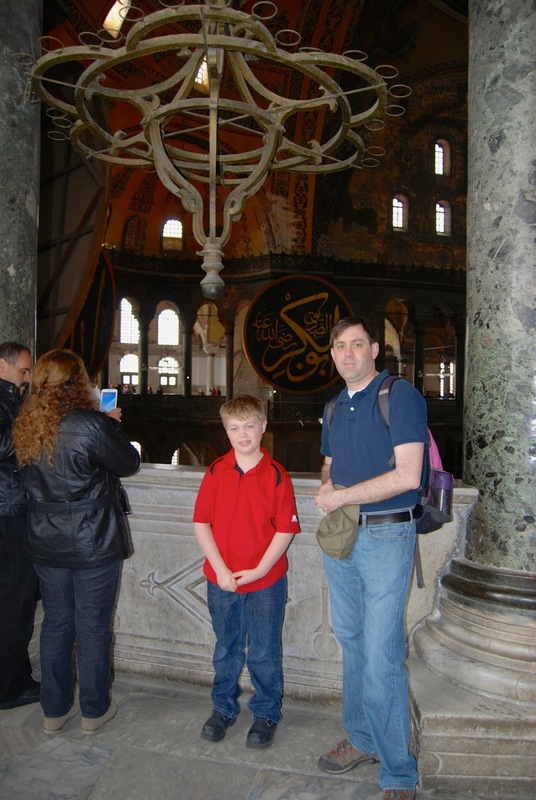 So based on my online research, the Hagia Sofia is best to go to first thing in the morning. We got there pretty close to opening time. When we were leaving the number of people wandering the museum was substantially more and the line to get in was so much longer. 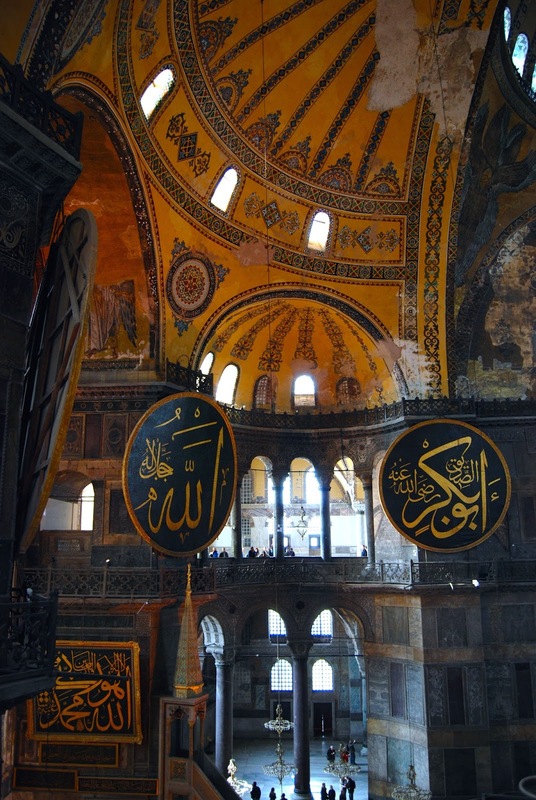 So according to their website, the name Hagia Sofia translates to literally mean 'Shrine of the Holy God'. Two other churches have stood at this site but were destroyed, the current building was rebuilt in 537 A.D. and was a Orthodox Christian Church for over 900 years. 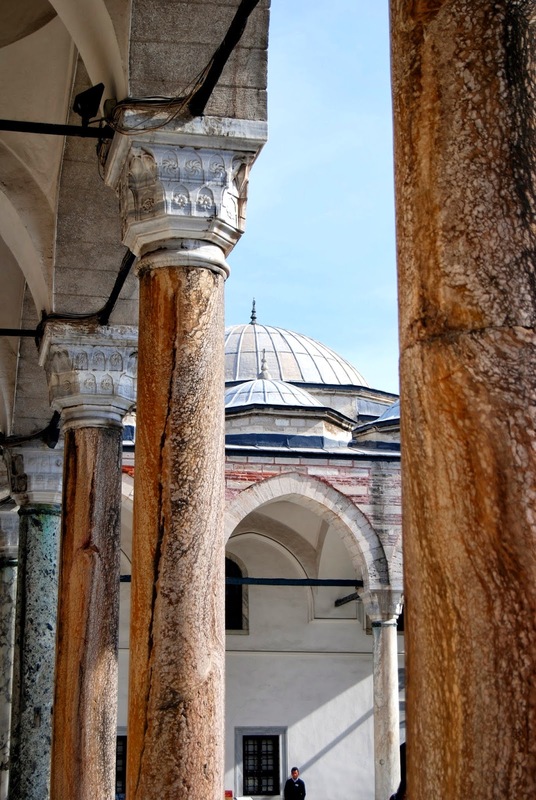 In 1453, the city was conquered by the Ottomans and it was turned into a mosque. 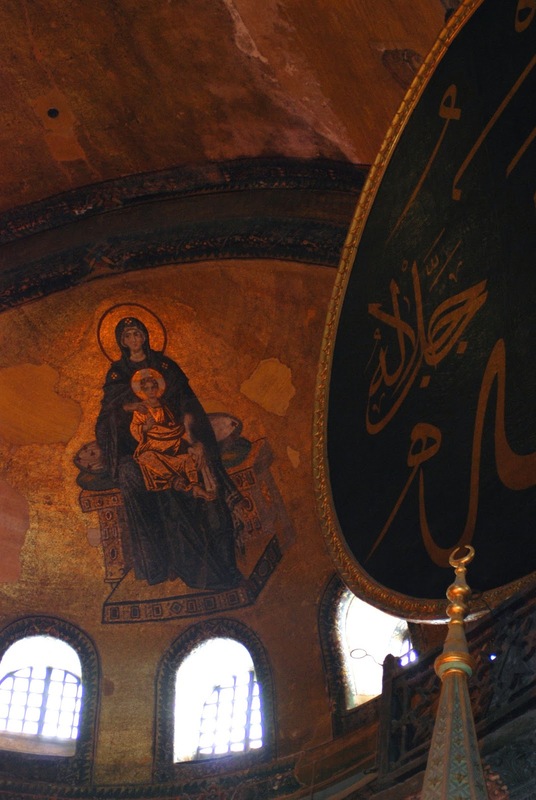 While a mosque, many of the Christian mosaics were plastered over. In 1935, it was converted to a museum and they are working on removing the plaster and restoring the mosaics (as well as repair other age related damage). Due to having been plastered over and being centuries old, you could not use flash photography of the Christian mosaics, so this the best picture we got. This one looks like Mary holding a toddler Jesus. All of us overlooking the great hall below (Clarissa was mad I wouldn't let her peek over by herself and therefore would not smile for a picture). The ceilings of the upstairs halls were pretty (and brightly lit). And what good ancient mosque would be complete without a giant urn that was once used to serve sorbet? 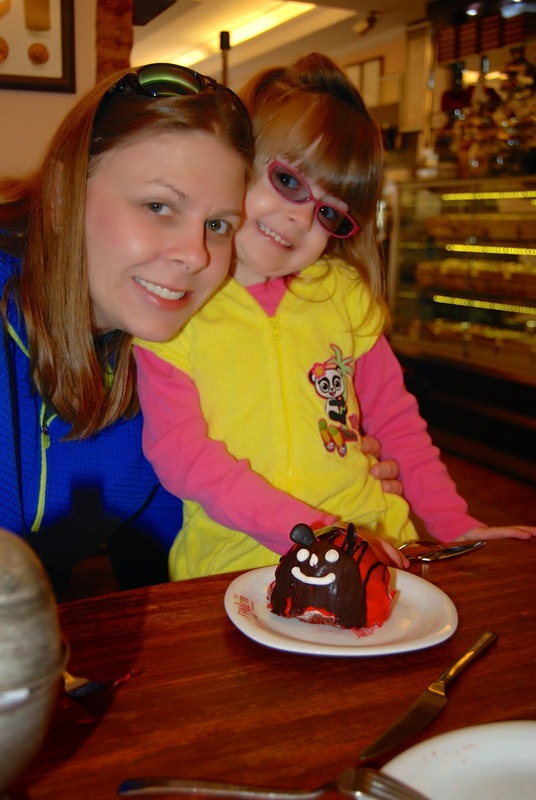 My ice cream loving daughter was even happy to smile look at the camera for this picture! So after the Hagia Sofia, we decided to stop for some lunch. We found a rooftop restaurant that touted 360 degree view.....so why not. So while waiting on our food we could see the Blue Mosque. The black speakers you see on the minarets (little towers) broadcast the call to prayer. 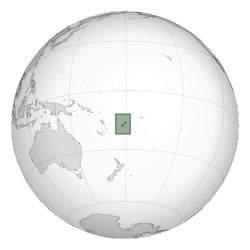 You hear this call 6 times a day, starting 2 hours before sunrise and ending just after sunset. The time varies day to day since it is based on the sun. The first one typically occurred at 5 am....we could hear it in our hotel room. There is a video later in the post where you can hear the call to prayer. We could also see across the Bosphorus Straits to the Asian side of Istanbul (sorry for the haze, don't have a filter to remove that). 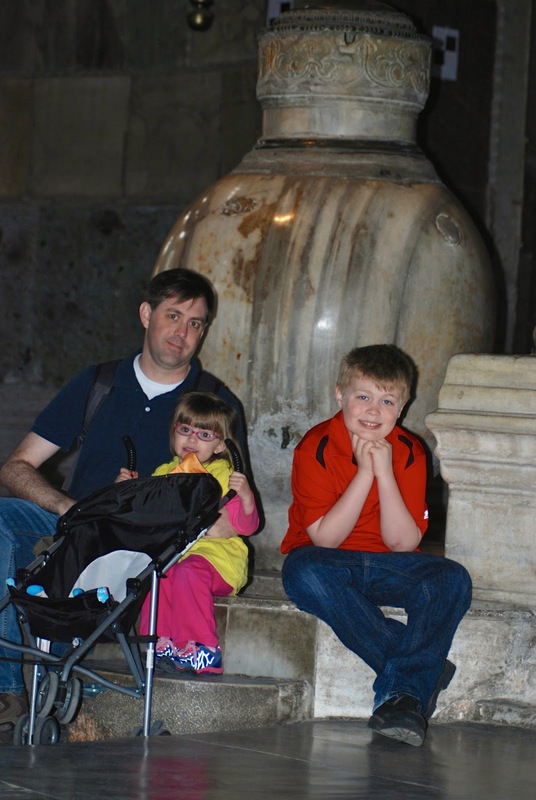 After lunch we went to the Basilica Cistern, this was the sight that Mason was most excited to visit. 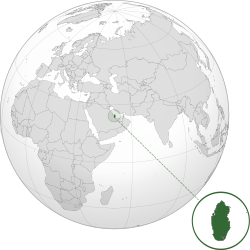 It is an underground palace of sorts built in the 3rd and 4th centuries. There are 336 Roman-style pillars in nice little rows. Each pillar is not the same, they had different decorations on the tops as well as there was a section with some square shaped pillars. Each one is 9 meters tall and the water was originally brought in from a place about 19 km away (remember, they didn't have tanker trucks back in the 4th century to fill it up with water). This was another place I buckled Clarissa into the stroller, with it being so dark and I didn't want her dashing off or diving in....but she was not the biggest fan of the darkness or the water dripping down from the ceiling. The highlight of the cistern in the very back there are two medusa heads at the base of pillars. One Medusa head is upside down and the other is sideways. Mason read the entire story/theories on how and why these Medusa heads are here. It was crowded at the Medusa heads, but Mason snapped a few pictures with his camera. His sideways head photo turned out best. 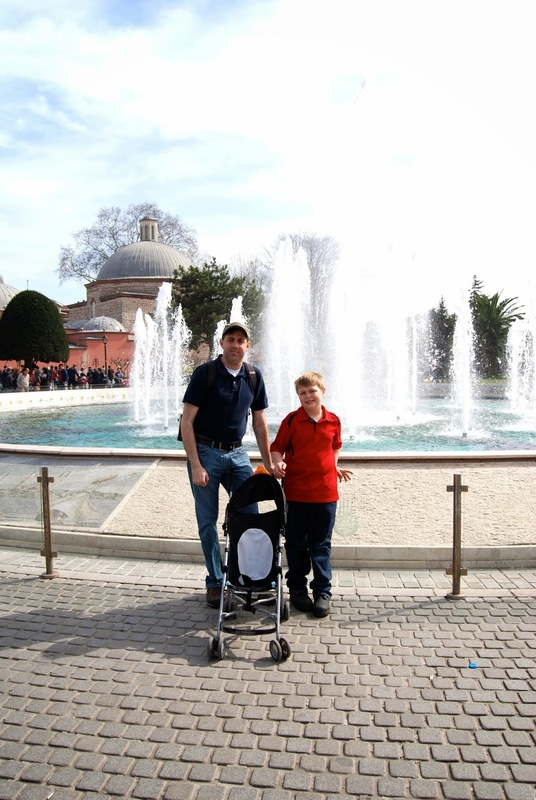 So following the cistern we walked over to the Blue Mosque. Given her full tummy and happy attitude in the cistern, we weren't surprised when Clarissa fell asleep on the way over. So Mason and I first went in and then Richard went in. You have to remove your shoes before going in, the entire floor is carpeted and no shoes helps protect it. The mosque is still used as an active mosque and is closed to the public during call to prayer times. We arrived after the midday call. According to the official website, it was built in the early 1600s. Lots of pretty stained glasses windows. 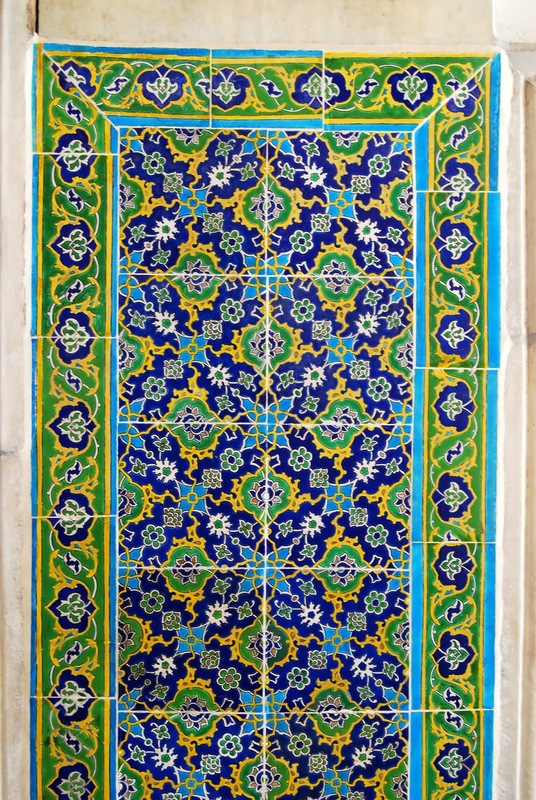 There are domes, domes and more domes within the mosque all adorned with beautiful tiles. The best view (according to our guide) of the mosque from the courtyard. So I mentioned we had a guide at the mosque. Lots of people approach you to show you around, we thought we were fine on our own. There are lots of stairs around the outside of the courtyard area. As I mentioned before Clarissa had nodded off and going up and down stairs was tricky with the stroller. One guide finally came up as we were headed for the tourist entrance and told us we could go through the main entrance since we had a baby. So after we all went in, the guide took us down this cute little street to his family's carpet shop. They had some really beautiful rugs (I never knew that rugs made with silk change color when turned in different directions). They even had some flying rugs when Mason asked. The man took a carpet off the stack, opened it, and tossed it in the air with a twist and it 'flew' to the ground.....we did not get a carpet because we travelled so lightly and brought only one suitcase, we didn't know how we'd get it back. So we started walking back towards our hotel. We walked through what is left of the hippodrome. Pretty much a couple pillars, a snake sculpture, and a brick path that is in the same place the chariots would race. Mason got a great shot of the pillar with hieroglyphics on it. We also stopped for a snack on a green area in front of the Hagia Sofia....how cool is that....eating skittles in front of such an ancient building. Even at the end of the day she was not wanting her photo taken.....(I think deep down she wanted to play in fountain....mean mommy said no)....but this is such a great shot of the boys I wanted to include it. We passed some colorful shops/homes on our way back to the hotel. So I booked Richard and I some massages in the evenings. We let the kids watch a movie. So while Richard was down getting his Balinese massage, I watched Frozen with the kiddos. At one point, Clarissa sits up and says 'I'm tired and going to bed, but you can keep watching'. This was her about 2 minutes later....looks like even her mermaid was exhausted! So for our last full day (it was a short trip), we only planned a few things. First stop, Topkapi Palace. 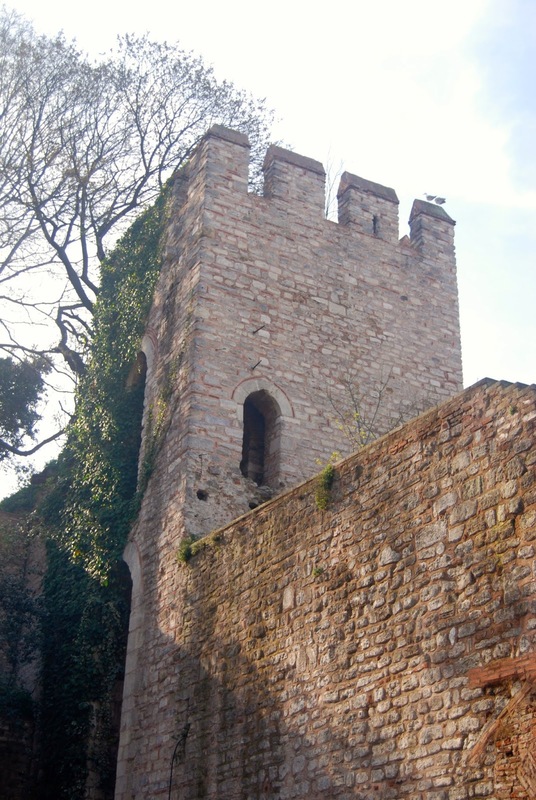 We took the tram which dropped us off outside the outer compound wall. We walked up the hill to purchase our tickets. Even 20 minutes before opening there was a decent sized line already. Kids had a snack (really? why do they need to snack an hour after breakfast) while I waited in line. Then we entered the Palace! 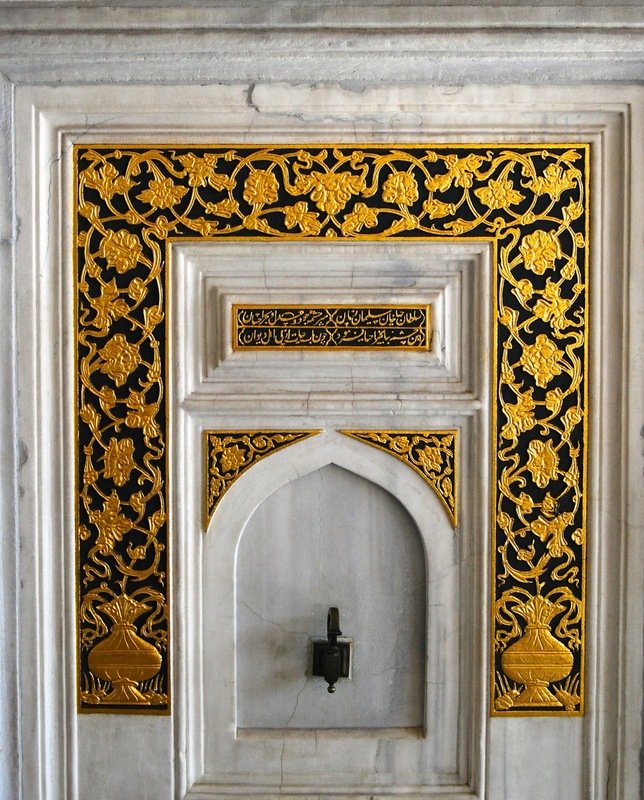 Construction of the Topkapi Palace began in 1460 according to the palace website and thirty-something Sultans called the palace home until the mid 19th century. 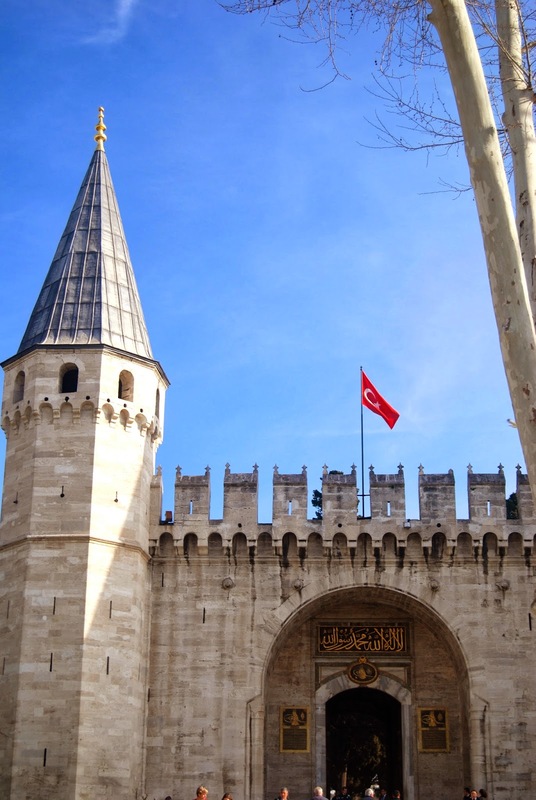 After the fall of the Ottoman Empire, the palace became a museum. There are a variety of courtyards throughout the palace. Each one becoming a more and more private place where less people were invited. There was beautiful domes, lots of gold, and tile work throughout. They had a Holy Relics exhibit that included Moses' staff, the prophet David's sword, Muhammed's footprints, cloak, and sword to name a few people I recognized. They also pieces of beards and teeth of other important people. There was a man reading the Quran over a speaker which you heard throughout the exhibit and walked past him on the way out. No photos were allowed in the Holy Relics section but here is the outside of it. There was a really cool (and appeared to be accurate....it at least showed the same time as our phones) sundial. (I am probably saying 'Don't touch the glass, somebody has to clean that'....flash back to my retail days and having to clean glass counters/windows....ugh). The kids Clarissa was done with the palace about 20 minutes into our visit. I'm glad we didn't pay extra to visit the harem.....we only saw about 1/2 of what was there to see. 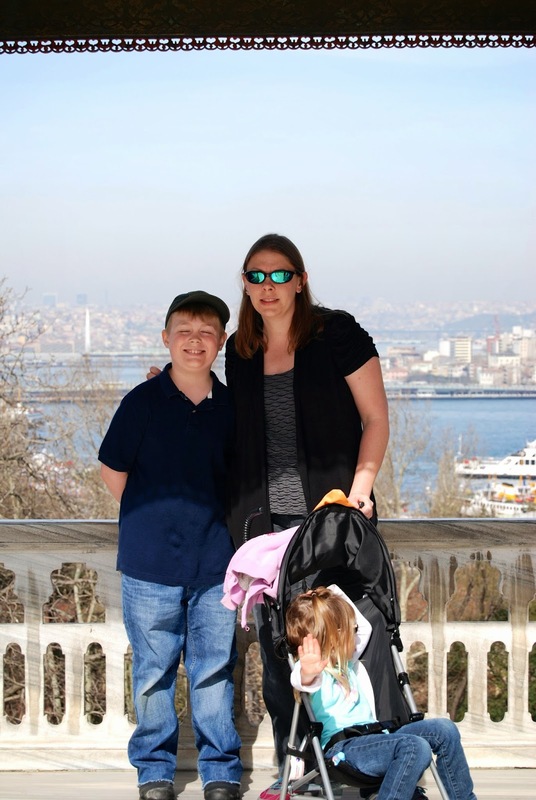 We did walk down to the part of the palace over looking the Bosphorus Strait. We told the kids that our car and household belongings went through that very spot on their way into the Black Sea, I don't think they were buying it (we'll just say Clarissa is leaned over laughing at the thought....as oppose to being difficult). The Bosphorus Bridge connects the east with the west. We were on the left side, the European side of Istanbul. To the right of the bridge is the Asian side of Istanbul. The İftar Kiosk was located in view of the water. It was under this kiosk that sultans would break their fast after sundown. I love how these photos match up! We were standing under the kiosk....Clarissa was ready to break her fast and wanted lunch....no more pictures! 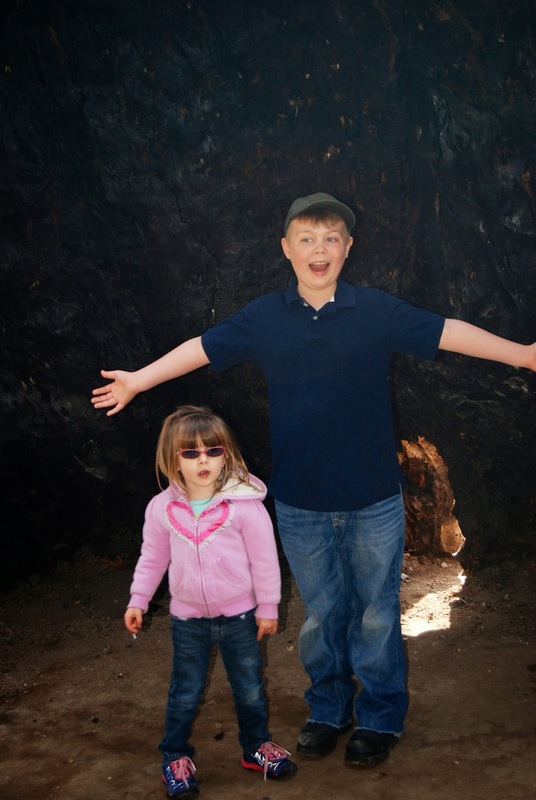 On our way out, the kids stepped inside one of the hollow trees.....It was pretty cool. On our way it was a little odd, they have military guards at the outer most gate holding sub-machine guns. One of the soldiers was being friendly with Clarissa and give her a cute smile and wave....while holding his big gun. So we stopped at a little outdoor cafe right outside the palace walls for lunch. While waiting for our food to arrive, Clarissa took some pictures. Mason only gets soda for special occasions.....he successfully argued that everyday of our 4 day trip was a special occasion. After lunch we headed towards the Egyptian Bazaar (also known as the Spice Market). The Grand Bazaar is more of a tourist market whereas the Egyptian Bazaar is more where the locals go to get their tea and spices. Wandering the streets from the palace to the bazaar was quite interesting. We walked through the camera/electronics district, the fabric district, ladies lingerie district.....it was quite interesting you would pass multiple shops all selling the same basic merchandise for a block or two and then it transition into the next district. We sampled some strawberry tea (which Mason is now a chia drinker due to Russian class) and bought some pomegranate tea. Richard sampled lots of Turkish delight throughout the trip (even brought some home). It is a candy made from chopped dried fruits and nuts, held together with a gel, and then dipped in confectioner sugar. We got a a bag of dried strawberries and mangoes. And of course we got a 1/2 kilo of strawberries that we polished off before our flight left the next day. Mason has always been a strawberry monster...Clarissa has been hesitant but has now joined the 'devouring strawberries is fun' band wagon. As we were leaving the Spice Market, we heard the midday call to prayer coming from the Rustem Pasha Mosque. Richard got a video of it. View outside the Egyptian Bazaar. Since Clarissa had nodded off again (she never takes naps at home anymore, go figure). 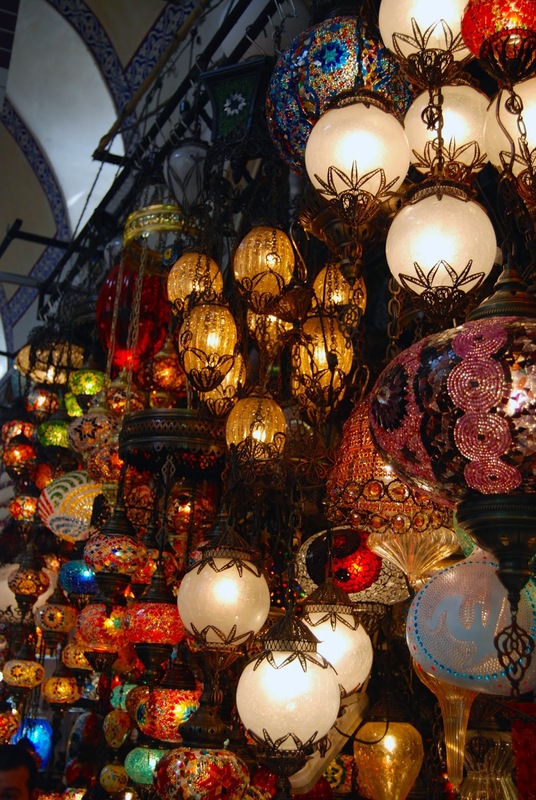 We decided to swing back by the Grand Bazaar one last time before leaving. We walked through some more interesting districts....the mannequin body district, military surplus district, kids birthday party supply district. At the Grand Bazaar the boys picked out some t-shirts and we got Clarissa some dress up Jasmine princess shoes. Richard was successfully negotiating the price of two t-shirts down. The current exchange rate is 1 Turkish Lira = $0.45. Richard had gotten the guy down from 60TL to 50TL but was still working on more. Mason using his super power math skills goes "Wow, that's like only $20" (aka that's cheap).....at which point Richard couldn't negotiate anymore and had to pay the 50TL.....sigh. After 3 days of yummy Turkish food, we opted to have dinner at an Italian Restaurant up the street from our hotel (keep in mind we haven't gone to an Italian restaurant since we were in the States...so that was a treat too). On the way back we passed this fruit stand.....yummy heaven for me! That evening I enjoyed a hot volcanic stone massage while Richard had his movie night with the kids. So the next morning it was raining (which made us glad we weren't trying to do some more sightseeing). We headed back to the airport and flew back to Tbilisi, passing snow covered Georgian mountains on our way in. We all survived our first international trip from our international home....all 8 passports and all! Looks and sounds like you got a whole lot done in Istanbul! The simit bread is a favorite in our home too. There is a vendor that plunks down outside our son's school at let out time - hard to resist! That last pic of Georgia from the plane is hard to resist. What a great welcome coming home. Ha! I just returned from a quick trip to Adana, with a layover in Istanbul. I, much like you, had this song stuck in my head constantly. NOBODY in my office in Alexandria knew what I was talking about. Just curious, were you a 96 WAVE fan?? I'm thinking this was one of the only stations that gave that song air play. Growing up in Charleston, who wasn't a 96 WAVE fan? !